Wright’s Writing Corner: New Writing Tip–Long Live Exposition! Long Live Exposition – Use the Long Life the Queen system to evaluate where to put exposition. Last week, I had to move a large chuck of exposition. It was stuck in the middle of a rather active scene and more than one reader had complained it was awkward and dull. I realized tat it had to be moved. But where? Ideally, I wanted it in a place where it would increase the readers interest, rather than bore them. But how to find such a place? I thought it was fascinating. How could I tell when readers would agree with me, and when they would groan and pull out their hair? In the end, I divided it into four pieces, putting each part into a place where it added to the scene rather than subtracting from it. I wish I could tell you I did it gracefully. I dissolved into a puddle. When I recovered from puddlehood, I had an insight that will, God willing, help me avoid the puddle fate in the future. It was about how to evaluate a passage to decide if a given piece of exposition would increase or decrease the reader’s interest. This insight revolved around the Japanese girls video game: Long Live the Queen. In order to explain my insight, I must first digress and describe the game. 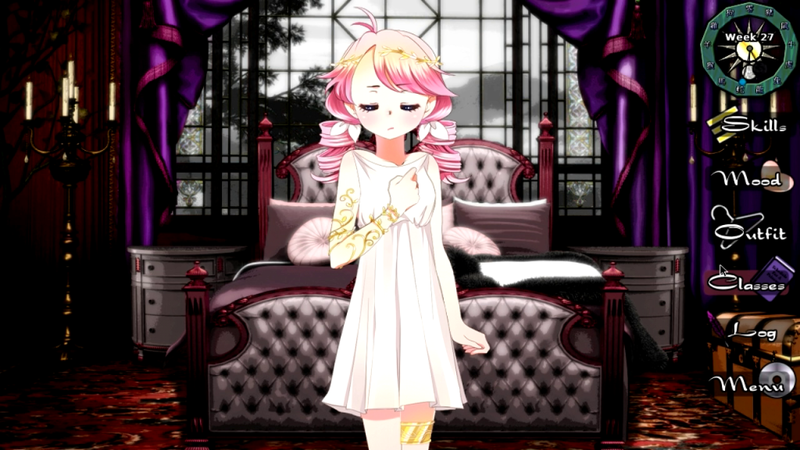 And here she is in her Magical Girl outfit. Her expression changes when her mood changes. Long Live the Queen is a text based adventure. 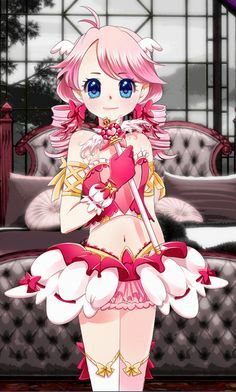 You play an adorably cute fourteen-year-old princess named Elodie who must live to her 15th year in order to be crowned Queen. Each week, you choose the classes you attends in order to gain skills you needs to survive. There are 39 skills to choose from, varying from Royal Deportment to Divination to Military Strategy Falconry to Magic. Each skill can be used to negotiate various events you must face. You cannot learn all the skills. The key to reaching the coronation is to pick the correct skills to allow you to pass the challenges you chose to undertake. Since learning skills is the difference between life and death, it is essential to learn as many as you can as quickly as possible. Whether or not you learn a given skill slowly or quickly depends upon your mood. There are eight moods (Angry, Afraid, Cheerful, Depressed, etc..) The actives you do in your free time—such as going to court or sneaking out of the castle—raise or lower these moods. If you pick the wrong activity, you can end up producing the wrong mood. This means you suddenly have a negative to learning the skill you need to pass the next challenge. Between the activities and the classes, comes the story. During these bits of text exposition, events happen. Friends visit. Commoners bring petitions. Nobles challenge you to a duel. Your country is invaded! These events can raise or lower your moods. Sometimes, they include skill checks that you pass or fail depending on the classes you’ve chosen. Occasionally, there are choices to make. Do you raise taxes? Lower them? Or keep them the same? Do you execute your magic using aunt? Or let her live? By now, I am sure you are wondering: what in the name of the All-Mighty this has to do with writing? Imagine you have written that wonderful description of your character’s relationship with his grandmother that you find just fascinating. You really want to include it in your story, but you are not sure where to put it. Use the Long Life the Queen rating system to decide where it should go! If adding your exposition takes away from the prevailing mood of the scene –that is like the princess discovering she can’t learn a skill she wants because her mood is wrong. Mark that spot as a –1. If the exposition does nothing for the scene, that is like having your princess take a class in a skill that currently has no modifier. It’s okay, but there’s no particular gain. And we all know how important it is to increase your skills before the next skill check—or you will eat the gift of chocolate without realizing that it is poisoned…and die! We’ll call that position a 0. Put your cherished exposition in the spot in your manuscript that has the highest Long Live the Queen rating. And if you can’t find a place to put it where it has an effect on the character? That’s the time to consider cutting it. Or rewrite it to have more of an impact. If you remember this simple rule and apply it when adding exposition and backstory, you may make it to your coronation—in the form of publication—without ever dissolving into a puddle. Which, really, is the best for everyone—especially your furnature. February 26, 2014 in Wright's Writing Corner.